I thought that it was inflammation of the CONTENTS of the scrotum ! Even more OUCH ! I edited after considering epi- but I may be wrong! Anyway I’m still squirming in my chair at the mention of a certain medical condition. Page 6 – I couldn’t find a candidate for a Private 15671 F. Robinson, 1/5 Cheshires but I couldn’t help noticing in my hunt that there is a MiC for a Private 15671 Joseph Robinson, Durham Light Infantry. Also in lines 21056 S/M Mowbray, J and 21057 Cpl Yuill C, could the word “Buried” be more relevant to Mowbray’s condition? Private 17850 J Halls, 2 KOSB is possibly Private 17639 James Hall, 2nd Kings Own Scottish Borders. 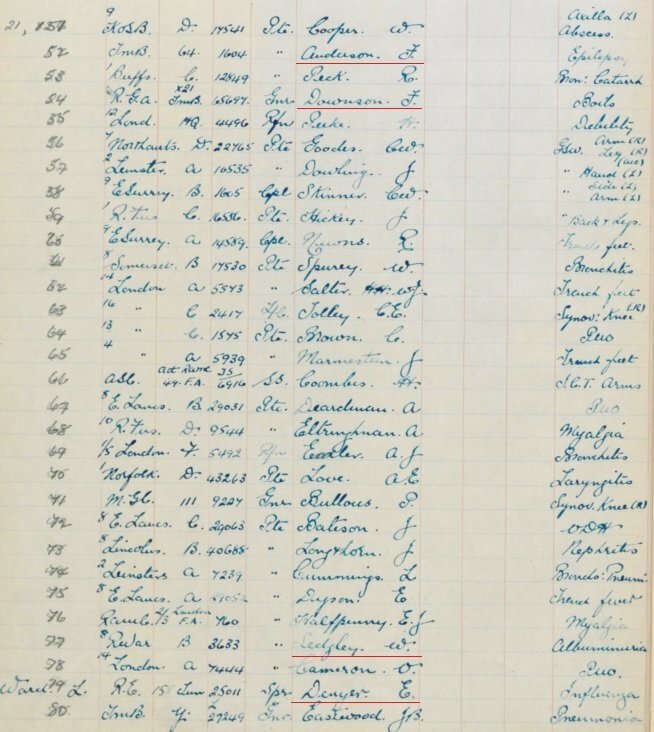 The MiC is held at the National Archive under reference WO 372/8/210417. James first landed in France on the 26th May 1915, qualifying for the 1915 Star, Victory Medal and British War Medal. He also received the Silver War Badge, being discharged on the 21st March 1918 as no longer physically fit for service. Private 59910 F Smith MGC is possibly Private 59911 Fred Smith, Machine Gun Corps. The MiC is held at the National Archive under reference WO 372/18/134949. He qualified for the Victory Medal and British War Medal. Rifleman 5134 W Smith 1/5 Londons is possibly Private 5144 William Smith. The MiC, held at the National Archive under reference WO 372/18/177068, shows him as 19 Battalion but that would have been at the end of the war. He qualified for the Victory Medal and British War Medal. He also received the Silver War Badge, however there are no additional details on the card. Once again, a sterling job in helping to clear up the queries. could the word “Buried” be more relevant to Mowbray’s condition? AND I have to thank you for using my all-time favourite word - serendipity! I tried looking over the previous pages but couldn't be sure there was a pattern, plus growing up we used to refer to "blind" boils and those were the ones that could end up having to be taken to the doctors to be lanced. I know thats not an approved medical terms but could not quite grasp why a sprained back would be buried - my initial thought is that by definition aren't all back injuries internal? However, thinking about it and having torn the deep muscles that are attached to the spine I guess I should have considered there could be a buried variety. I think the word buried is referring to how he sprained his back - unfortunately by actually being buried in soil/rubble. Perhaps the extra information is to look for crush injuries/breathing difficulties. Private 5329 G Atkins 14 Londons has potentially two matchs, both shown on their MiC’s as 14th Battalion. The first is Private 5327 Garret S Atkins, later Private 511701. His MiC is held at the National Archive under reference WO 372/1/143238. Looking at the card that first name could just as easily be Garnet. He would also receive the Silver War Badge as well as the Victory Medal and the British War Medal. 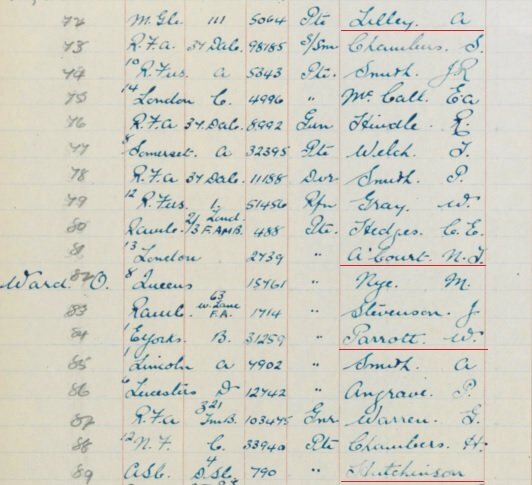 Ancestry has a Pension Ledger Card for a Garnet Seymour Atkins. He too qualified for the Victory Medal and the British War Medal and also received the Silver War Badge. Both men appear to have survived the war. Private 18505 A Prennser 11 Royal Warwicks could possibly be Private 28959 Albert C Rencher, Royal Warwickshire Regiment. He qualified for the Victory Medal and British War Medal. Looks like his Service Records are on Ancestry (and presumably FindMyPast) as Albert Charles Rencher. He was also Sergeant 188207 Labour Corps. He qualified for the Victory Medal and British War Medal which were issued by the Labour Corps. He also received the Silver War Badge. "I think the word buried is referring to how he sprained his back - unfortunately by actually being buried in soil/rubble. Perhaps the extra information is to look for crush injuries/breathing difficulties." I think you're right. The Battalion War Diary for the 9th East Surreys has a part of a trench blown in on the 13th and a shelter destroyed on the 14th. 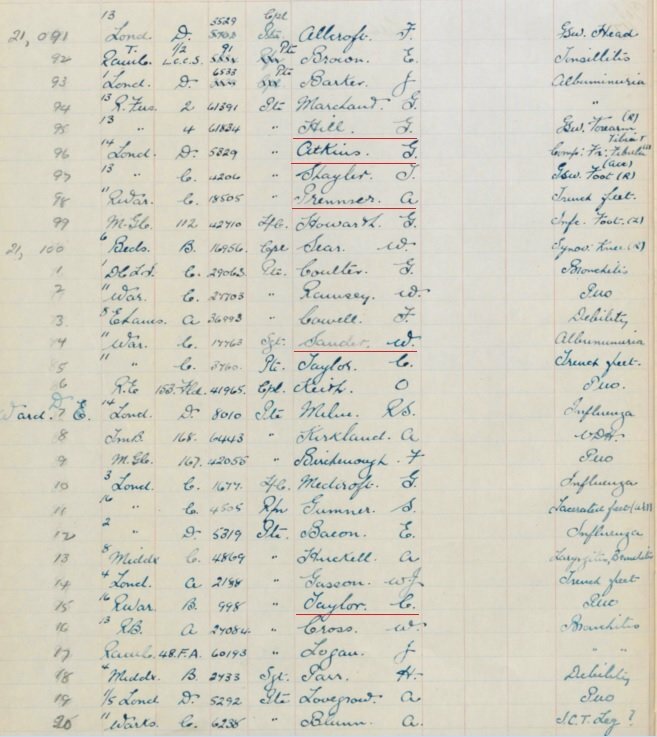 Fortunately for this purpose the online version of the diary entry has part of the appendices attached which refers to the daily casualty list. Our 18 pdrs retaliated whenever Minnies were sent over. At 11.30 a.m. one of our Stokes Guns fired 12 rds, which drew instant retaliation of darts on the left Coy & about 6 Minnies on the Centre Coy. Enemy minnied & sent over darts around GREEN CURVE as follows:- 2.45 p.m. – 3.45 p.m. 2 Minnies & several darts, showers of darts at 9.5 p.m. & 9.10 p.m.
9.45 p.m. – 10.15 p.m. 6 minnies & several darts & also 1 or 2 darts & 1 or 2 minnies around No.5 CRATER POST, were a trench was blown in in one place. Thanks for the WD entry and all the corrections/assumptions. You're doing a brilliant job! Lance Corporal 26965 P Deacy 13 Middlesex is likely to be Percy Dewey, Middlesex Regiment. 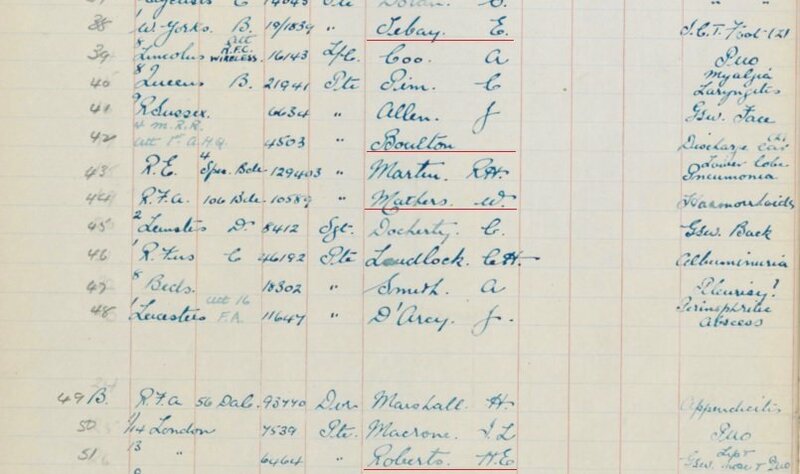 The National Archive Catalogue has the MiC reference as WO 372/6/15220, gives his rank as Private and his service number as G/2696 (Incomplete). However a look at the card shows him as G/26965. He qualified for the Victory Medal and the British War Medal. 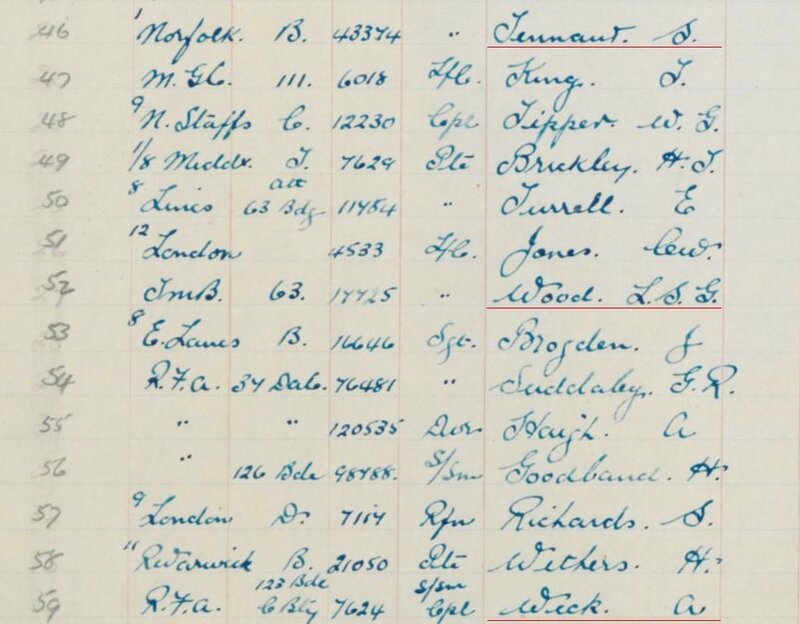 There is a Private 4677, Frank Ashenden, Royal Sussex Regiment who became G/16494 in the same regiment and a Private 4221 Percy G. Burden who became G/16497. Although it might be a coincidence, obviously Awcock would fit in if this batch of soldiers were renumbered on an alphabetical basis. 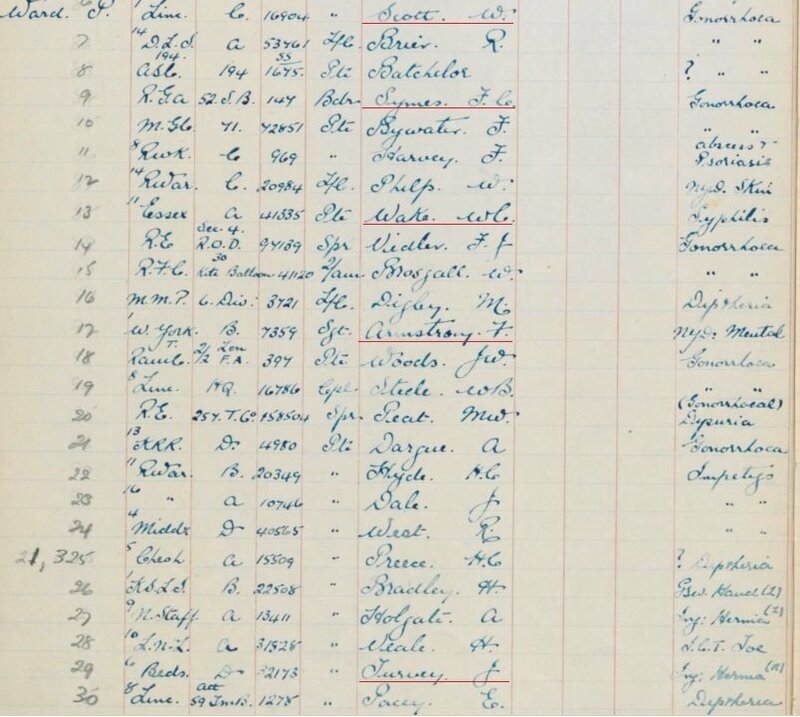 If his renumbering was missed at the records office then that could perpetuate through to medal details, especially if his records were transferred because he’d switched units. That leads to considering a possible match in Private 4215 Frederick Awcock, Royal Sussex Regiment, who would subsequently serve with the Army Service Corps as Private M/324262. His card, held at the National Archive, shows his Victory Medal and British War Medal as issued by the RASC. A few, but not all of the Gun Shot Wound victims listed so far appear to be in the official casualty lists printed in The Times. I’ve cross referenced them to where they are listed above and highlighted differences. Private 1604 F. Anderson Trench Mortar Battery. My understanding is that these men were normally attached for another unit, (infantry for the Light Mortars, RFA and RGA for medium and heavy) in which case probably worth considering is Private 16/1604 Frank Anderson, Northumberland Fusiliers. He would so on to serve with the (Kings Own) Yorkshire Light Infantry, regimental number 37905. He would be killed in action on the 23rd October 1918 serving in France & Flanders with the 9th Battalion KOYLI. Soldiers Died in the Great War has him as formerly 16/1604 Northumberland Fusiliers. The relevant MiC is held at the National Archive under reference WO 372/1/81409. He qualified for the Victory Medal and the British War Medal, although his MiC indicates they were issued by the Northumberland Fusiliers. His regimental number indicates he was with the 16th Battalion. That unit was disbanded in February 1918. First entered a Theatre of War on the 14th October 1914. Qualified for the 1914 Star, Victory Medal and British War Medal. Sapper 138785 W Adams, Royal Engineers – Possibly Sapper 132788 William H Adams, Royal Engineers. MiC at the National Archive under reference WO 372/1/19825. Landed in France 31st October 1915. Qualified for 1915 Star, Victory Medal and British War Medal. Discharged Z Reserve 9th May 1919. Private 45738 H Gray, King’s Own Yorkshire Light Infantry – Possibly Private 43738 Andrew B Gray, King’s Own Yorkshire Light Infantry, subsequently 614520 Labour Corps. Card held at the National Archive under reference WO 372/8/104781. Qualified for the Victory Medal and British War Medal. Medals issued by the Labour Corps. Private 24695 S Starkey, MGC. May be a co-incidence but there is a Private 24695 James Starkey, King’s Own Yorkshire Light Infantry who would go on to serve as Private 72308 Machine Gun Corps. Qualified for the Victory Medal and British War Medal. Medals issued by the Machine Gun Corps. He would also receive the Silver War Badge. Private 6451 C Baxter, London Regiment. Worth considering is a mystery card at the National Archive for a Private Charles Baxter, 3rd London Regiment. The card has slipped during the scanning process and so the service numbers are all but illegible, having been cut off the page. He had two numbers with that unit, the second one commencing with a 2. 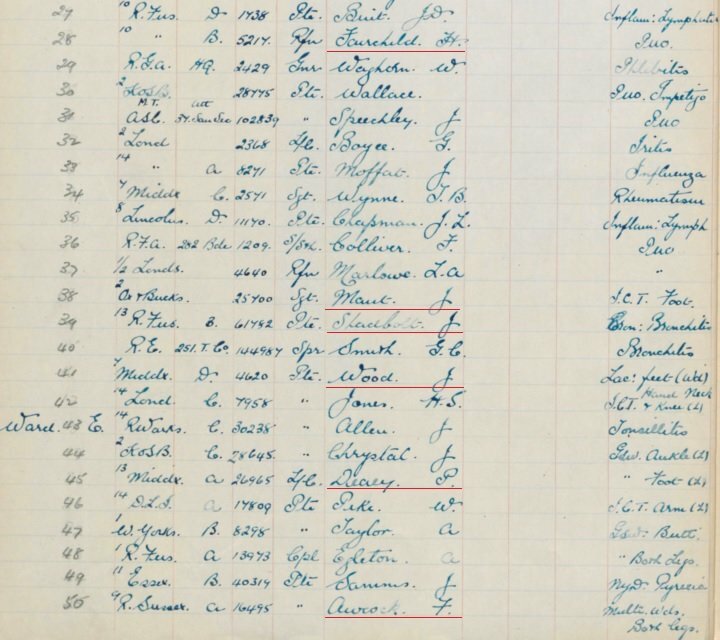 In my experience the Medal Rolls of the London Regiment are usually very detailed, so it may be someone with paid up membership to Ancestry can check via that and then confirm whether he is a possibility or not. S/S (Shoeing Smith?) Corporal 7624 A Wick, Royal Field Artillery. A possible to consider is Corporal 17634 Albert Wick, Royal Field Artillery. He would subsequently transfer to the Royal Air Force, with service number 187910. Unfortunately doesn’t look like he was a day 1 transfer from the RFC to the RAF, so I don’t know what that man’s Army trade was. Card is held at the National Archive under reference WO 372/21/149012. Qualified for the Victory Medal and British War Medal. Medals issued by the Royal Air Force. Discharged to “G” Reserve 12th May 1919. Private 5064 A Lilley, MGC – Worth considering is Private 5967 Arthur Lilley, Machine Gun Corps, originally 18517 Lincolnshire Regiment. 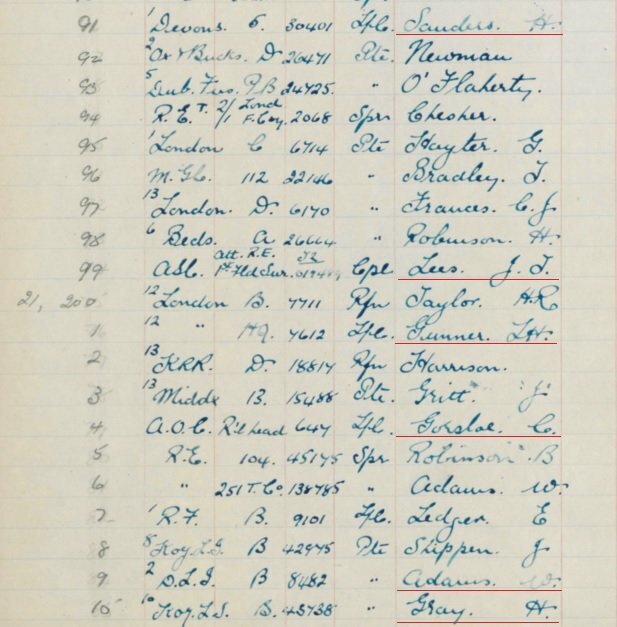 The Medal Index Card is held at the National Archive under reference WO 372/12/89690. Qualified for the Victory Medal and British War Medal. Medals issued by the Machine Gun Corps. Private 2739 N T A’Court, London Regiment – supect this is Private H. Thomas A. A’Court, 13th London Regiment, although the card shows him as service number 315478. 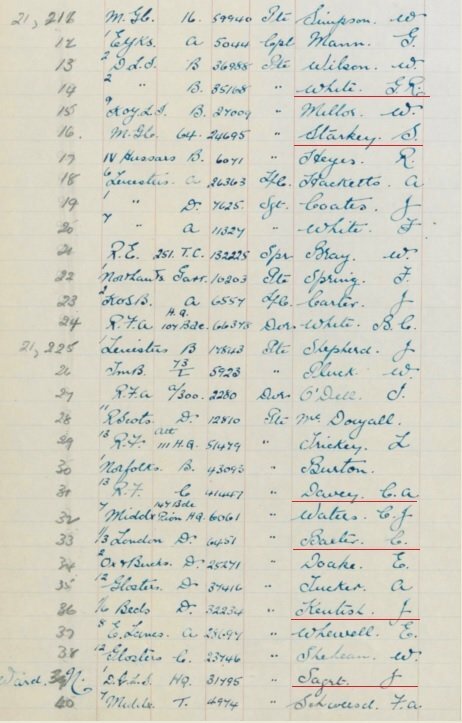 That’s a six digit service number which suggests a possible renumbering in early 1917 – possibly the first number wasn’t captured on the MiC.The entries on the MiC, held at the National Archive under reference WO 372/1/28, are a tad confusing. At some point he was Corporal 52567 Rifle Brigade, but his medals were issued by the London Regiment.Written across the top of the card is another service number 490627 which is not included in the National Archive Catalogue and presumably was also with the London Regiment. I think it's important to put possibles here as the registers have all sorts of errors - initials, numbers, even regiments. Agreed - I'm trying to stay away from the weird and whacky and sticking to the most obvious transcription errors, although sometimes it can come down to trying to imagine someone saying their name with a regional accent - particularly if in pain, doped out of their mind or sleepy - presumably given the start and arrive dates these trains travelled overnight. Couple more for you, and in both cases I think "probably" is justified. His Service Medal MiC says he was discharged to Class Z. Sergeant 7359 F Armstrong. West Yorkshire Regiment – probably Sergeant 7357 Frank Armstong, 1st West Yorkshire Regiment. He would finish the war as Acting Warrant Officer Class 2. 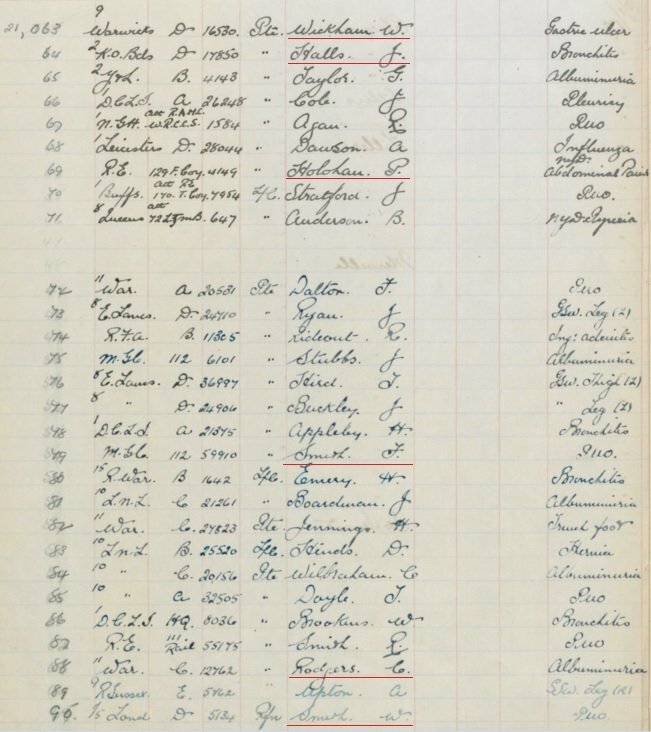 MiC is held at the National Archive under reference WO 372/1/114621. He landed, (probably in France), on the 8th September 1914 and qualified for the 1914 Star with Clasp, Victory Medal and British War Medal. He is also shown as appearing on the Silver War Badge Roll.